Bring your DS or Pokemon cards to battle, trade and make new friends! Ages 6-12. (90 min.) Preregister. Celebrate Teen Tech Week with a night of video games. Play Smash Bros on the library’s Wii or try out funny and free smart phone and tablet games perfect for group play. Snacks provided. Ages 12-17. (2 hr.) Preregister. Acreage Anime Club Presents Haru Matsuri! Rave or trash the current book, graphic novel or manga you’re reading and share it while making ice cream sundaes or root beer floats. Join your friends or make new ones! Grades 6-12. Limit 15. (60 min.) Preregister. Celebrate the ancestor festival of Obon with anime and snacks! Chat with friends and fans about cool holiday traditions from Japan. Ages 12-17. (2 hr.) Preregister. Bring your DS or Pokémon cards to battle, trade and enjoy a snack with new friends. Ages 6-12. (90 min.) Preregister. Recently I read volume one of the Courtney Crumrin series, The Night Things. 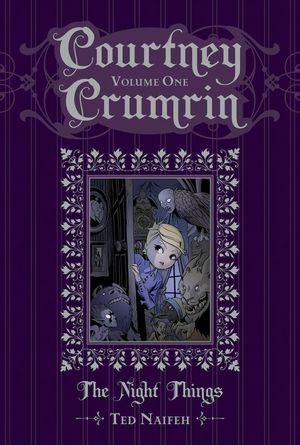 The series is written and illustrated by Ted Naifeh, the former illustrator of the wonderful Gloomcookie series. The Courtney Crumrin series follows the young eponymous girl as she, along with her greedy and distant parents, moves in with her Great Uncle. Shortly after moving into her Great Uncle’s old mansion she discovers that her uncle is hiding a strange secret, along with powerful books that allow her to tap into the supernatural. The Night Things focuses heavily on Courtney’s interactions with the mysterious creatures that she meets, such as goblins, talking cats, changelings, and fairies. The book seems to be aimed at pre-teens and teens, between the ages of 12-17. There is also a heavy emphasis on strong and independent female characterization. The Courtney Crumrin series is a great resource for young adult librarians looking for unique programming ideas. It is also a good way to introduce young women to the graphic novel medium. A library program planned around the Courtney Crumrin series could focus on exploring the various folklores that the book touches on, as well as promoting the spirit of learning and wonder that Courtney embodies. As far as the folklore goes, there are times that Courtney interacts with creatures that have a long history in the mythology of various cultures. For example, there is a scene where she goes to a fairy world and is warned against eating or drinking anything. This would be a great way to incorporate Irish folktales that deal heavily with mortals entering fairy worlds and being trapped after accepting food or drink from the fairy inhabitants. Library participants could write their own stories based on the folklores and mythical creatures that Courtney discovers. The activity would allow young library patrons to tap into their own creativity, as well as learn more about other cultures and folktales.